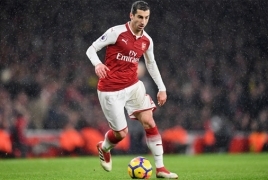 PanARMENIAN.Net - Armenian midfielder Henrikh Mkhitaryan made a winning return to the Arsenal side on Saturday, February 9 as the Gunners beat Huddersfield 2-1 at the John Smith's Stadium. The Armenian international was at the heart of the action as first-half goals from Alex Iwobi and Alex Lacazette sealed an important away victory. Mkhitaryan told the media that he is aiming to help Arsenal win as many games as possible having returned from injury. “We will try everything to win every game because every point is important so now we can be focused on the Europa League and then back on the Premier League after that,” he told the club’s official website.